How many employees can say that the owner of their company was keeping track of their EBay purchases? And how many of those employees can say that the owner was concerned that they might not be buying enough old baseball cards with their company credit card? Well, if you guessed “one,” that one was probably me. 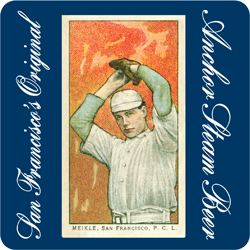 Not long after PacBell (now AT&T) Park opened in San Francisco, a fellow Anchorite, Dan Mitchell, approached Fritz Maytag, owner of Anchor Brewing since 1965, with a concern. 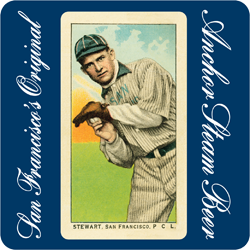 One of the restaurants pouring Anchor Steam® Beer at the new ballpark was struggling, not because of the beer or the food but because their restaurant’s decor didn’t have anything to do with baseball. Dan wisely suggested life-size San Francisco baseball cards. 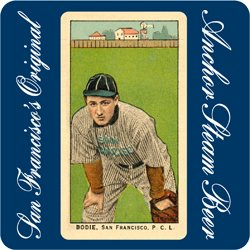 The only problem was that San Francisco Giants cards were subject to the rules and regulations of Major League Baseball and the San Francisco Seals baseball cards from the great DiMaggio era were still in copyright. So I had a crazy idea, which I was crazy enough to propose to Fritz. 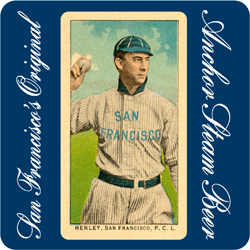 What if we looked all the way back to San Francisco’s legendary championship ball club (bear in mind that the Giants hadn’t yet won their first World Series in San Francisco), the 1909 San Francisco Seals? “Have fun,” said Fritz. And I did. 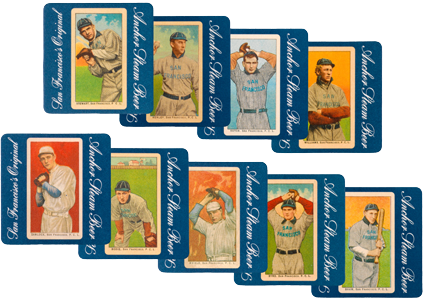 Imagine it: One mission, no budget: Collect the coolest original Seals baseball cards you can find, featuring the players that brought San Francisco its first Pacific Coast League championship. I was suddenly a 12-year-old kid again—with a credit card! Within a few months we’d collected some amazing cards, all from Obak, a nineteenth-century cigarette company, which put baseball cards in packs of cigarettes. Not as politically correct as the cards that came with gum, but every bit as collectible! Fritz and I picked our favorite nine (how’d we think of that?) cards based on the look and condition of the cards, the player’s positions, and their stats. We scanned them and created, thanks to designer extraordinaire and Giants fan Jack Martin, life-size, Anchor-logo’d, cards for the PacBell Park restaurant and, ultimately, coasters, postcards, metal tackers, etc. for the Brewery. Below are the cards and the stories of these amazing players. Thanks Dan. Thanks Fritz. Thanks Jack. Thanks SF Brews & Baseball! 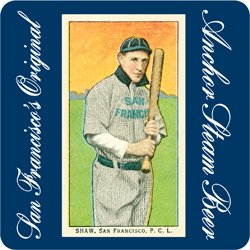 On March 26, 1903—seven years after Anchor Brewing began making beer near San Francisco’s Russian Hill—the team that would become known as the San Francisco Seals played its first Pacific Coast League game. Paid attendance at Recreation Park, south of Market Street, was 5,235. Ladies were admitted free. 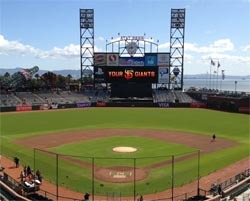 San Francisco defeated Portland 7–3, in a 90-minute, 9-inning contest. Six years later, the Seals won their first pennant, with a 132–80 record. 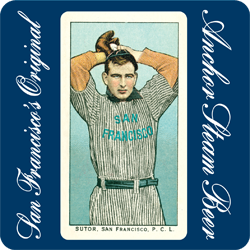 By that time, Anchor had moved south of Market, near where it continues to brew San Francisco’s original Anchor Steam® Beer today. Frank Stephen “Ping” Bodie was born Francesco Stephano Pezzolo in San Francisco in 1887. The nickname “Ping” came from the sound of a Bodie hit; the surname “Bodie” came from the California gold rush town of Bodie—now a ghost town—where his father worked the mines. After leading the PCL with 30 homers in 1910—a phenomenal achievement in the dead-ball era—Ping went on to play for the White Sox, the Athletics, and Babe Ruth’s Yankees. Born in Crisfield, Maryland in 1889, pitcher Harry Clifton Byrd returned to his home state after a brief stint with the San Francisco Seals. He played a key role in the formation of the University of Maryland as well as the adoption of its mascot, the diamondback terrapin. Byrd was president of the University of Maryland from 1935 to 1954. Seals pitcher Clarence T. “Cack” Henley was born in Sacramento in 1885. On June 8, 1909, he hurled a 24-inning, 3½ -hour shutout of the Oakland Oaks. His 31–10 record in 1909—an astounding .756 winning percentage—was key to the Seals Pacific Coast League championship that year. In 1910, he led the league in games pitched, complete games, and wins, finishing with a 34–19 record. In the 1909 season, Willard Meikle pitched two of the Pacific Coast League champion Seals’ 132 wins and one of their 80 losses. His record was 10–11 in 1911, after which he left the Seals to pitch for the Seattle Giants. They won the Northwestern League pennant in 1912. Born in Yakima, Washington in 1884, the versatile Royal N. “Hunky” Shaw played in both the infield and the outfield for the Seals. His .281 dead-ball-era batting average earned him the Pacific Coast League batting title in 1910. On May 16, 1908, the 5’8″ switch hitter made his only appearance in the majors—as a Pittsburgh Pirate. “Handsome” Harry Richard “Rube” Sutor led the Pacific Coast League in strikeouts in 1908 with 256 and in 1911 with 339. The Missouri-born southpaw spent the 1909 season with the Chicago White Sox. 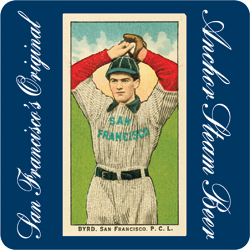 He returned to the Seals in 1910 and, on April 25, 1911, pitched a 9-inning no-hitter against the Oakland Oaks. Pitcher Harry Stewart hit .318 in his 22 at bats for the 1909 Pacific Coast League champion San Francisco Seals, including a double and a triple. His record that season was 3–4. He finished the 1910 season with an 8–12 record, throwing 78 strikeouts. In 1911, as a Vernon Tiger, Stewart had a 19–12 record and led the league in hit batsmen. 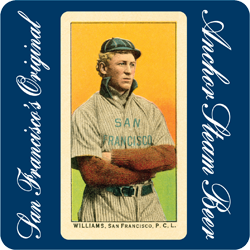 Richard “Nick” Williams pitched and played first base for the San Francisco Seals—sometimes on the same day. He hit .223 during the Seals’ 1909 championship season. Williams managed the Seals during their 1928 and 1931 championship seasons, including their shutout of Portland on April 7, 1931—opening day at the new Seals Stadium. Pitcher Carl Eugene Zamlock was born in Oakland in 1889. The 6’1″ right-hander played with Ty Cobb and the 1913 Detroit Tigers. From 1925 through 1931, he coached the University of California Golden Bears baseball team to a stellar 34–17–7 record. 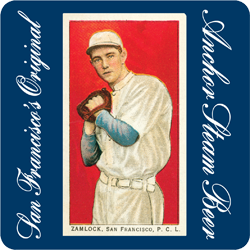 In the early 1930s, Zamloch was manager and part owner of the Oakland Oaks. The cards are magnificent! How may I purchase a set?